For use in our upcoming NIH-funded outpatient clinical studies. 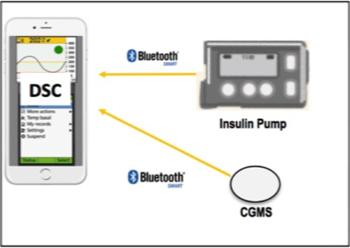 iPhone based app provides wireless communication to the Dexcom G4 CGM and Insulet Omnipod insulin pump. Open loop (manual control), Hybrid closed loop control and Fully Automated closed loop operating modes provide a range of operation for all situations. The latest version (2.3 FL) of the dosing algorithm is integrated into the app. The app is fully fault tolerant, meaning that if an issue arises with the iPhone, CGM or pump it is addressed safety and quickly. The app is integrated with the Dexcom Share/Follow remote monitoring system allowing remote monitoring over the internet.